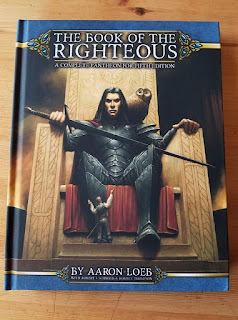 In 2016, Green Ronin conducted a Kickstarter to update The Book of the Righteous to D&D Fifth Edition. The print book debuted at GenCon 2017, and backers like me received their copies about the same time. I had never acquired or read the original Book (written for v.3.0), largely because it was a thick, expensive hardcover (320 pages!) and I tend to prefer creating my own pantheons for my D&D campaigns. However, I've come around to thinking that I should try using those gods in my next Freeport campaign. The City of Adventure uses deliberately generic deity names (God of the Sea, God of Pirates, etc.) to make it easy for DMs to fit Freeport into their own campaigns. Using the gods from The Book of the Righteous seems the next logical step in creating a more uniquely "Ronin" campaign. The 5E version of the book also promised to have a wealth of new crunchy bits for religious characters. One of the few real disappointments I've had with the 5E Player's Handbook is how short the list of domains is compared to 3E. The new Book of the Righteous fills in most of the "missing" domains, and adds some new ones (like Beauty and Corruption). Non-clergy in the gods' service also get new options, with at least one new subclass or other option for each class in the Player's Handbook. That's very welcome material for a DM like me who enjoys homebrewing, because it facilitates giving each god and their church a distinct flavor. That's ultimately what sold me on backing the Kickstarter. The four most prominent gods in Freeport are the Gods of the Sea, Knowledge, Warriors, and Pirates. Shalimyr, CN god of water, is perfect for both the God of the Sea and God of Storms. His domains are Tempest and Water. Tinel, god of magic, knowledge, and truth, fills the role of both God of Knowledge (in his CG aspect, which is open with knowledge) and God of Magic (in his N aspect, which keeps secrets). His domain is Knowledge, but the text implies that similar domains would also be appropriate. The Arcana domain (from the Sword Coast Adventurer's Guide) would be another good choice for clerics of his archmage aspect. The God of Warriors could be either Terak, LN/LG god of war and valor, or Canelle, CG goddess of victory and strength. The God of Strength has a separate shrine in Freeport's Temple District, making Terak the better choice for the local war god, despite FCoA listing all these martial gods (Strength, Valor, and Warriors) as chaotic. The Book of the Righteous mentions Freeport a handful of times. Two of those references (pages 103 and 162) state that Darmon, CG god of travel, wealth, and joy, is worshiped as a god of pirates in that city, and the latter mention suggests that the heretical Cult of Possession (CE) runs his temple there. Darmon is also God of Roads and God of Commerce, and possibly the God of Luck. I would recommend using the name Darmon for his more reputable aspects, and Harrimast for the god of pirates. (The name "Harrimast" is never used in FCoA, but was applied to the canonical God of Pirates in many earlier Freeport titles.) Darmon/Harrimast's domains are Travel and Trickery. Maal, LN god of law and justice, is both God of Justice and God of Retribution. His domain is Balance. Maal is the god of the Hexworth Inquisition, on the Continent (see FCoA, pp. 293-295). Many of his courts and inquisitors in that nation have been corrupted by the excessive zeal of the Necromantic Censure. Morwyn, LG Goddess of Healing, has the Life domain. The "God of Life" is a nature god rather than a healer. Use Rontra, LG goddess of the earth (domain: Earth or Nature); Eliwyn, the N Tree of Life (whose guardians are druids); or Thellyne, NG goddess of woodcraft, nature, and the hunt (domain: Nature). Thellyne best matches the alignment given in FCoA. Urian, NG god of the air and sky, is the God of the Sun. His domains are Air and Light. Mormekar, N God of Death (and rebirth) has the Repose domain. The corrupted Cult of the Icy Breath (NE) worships him as God of Murder, using the Death domain. As God of Death, Mormekar is also popular among the Druzhdin of the Continent (see FCoA, pp. 291-293). Thellos, NE god of greed, gluttony, and desire, seems the best match for an evil God of Thieves, though Darmon and the Cult of Possession both have significant followings in the criminal underworld. Thellos also qualifies as God of Lust (though Aymara, CG goddess of love and the arts, and Zheenkeef, CN goddess of wine, madness, and inspiration, provide non-evil alternatives). Followers of the God of Penitence worship either an aspect of Shalimyr (attended by his holy ascetics, separately from the local sea god's temple) or of Mormekar (possibly led by one of the Reborn). It's conceivable that both may be true, if the shrine was established by an atoning Shalimyn. Some of these unique gods are given more detail in Cults of Freeport. I intend to write a future column about using that sourcebook with The Book of the Righteous. In addition, cults of Asmodeus (LE god of lies, power, and fire) and various archdevils have operated in Freeport in the past (see especially Hell in Freeport). The King of Hell's domains are Fire and Tyranny. The Eternal Flame, worshiped by the azhar of Kizmir, may very well be a part of the secret church corrupting the faith of Anwyn, LG goddess of homes, the hearth, and servants. The conspiracy's priests are LE. The Way of Astrape is the dualistic faith of Tagmata, in which saints are revered instead of gods. Consider this religion to be NG with the Light domain. Its holy warriors are paladins with the oath of devotion. Note that the Great Church has not yet been mentioned in any of these suggestions. In the World of Freeport, that religion either lacks the ubiquitous nature ascribed to it in The Book of the Righteous, or it is most active in regions not dominated by a specific god's church. The latter would be the case in my proposed "all-Ronin" take on Freeport. For example. the Great Church is unlikely to have as much influence in Hexworth, where the Inquisition rules supreme, as it would in the more cosmopolitan Ivory Ports. It lacks a proper temple in Freeport, though the Continental Great Church almost certainly sponsors missionaries to seek converts in the city.